There is the terry towel of intensive green color of grass shade. It is very pleasant for bathing especially due to the using of Two flying fairies with one flower embroidery design for decoration. It is the picture of the couple of little magic girls in fluffy dresses with transparent wings. They keep the one wonderful flower in their hands. Its petals have all colors and ornaments you can imagine. 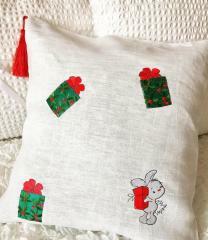 This is nice embroidered cushion which is able to be good memorable souvenir for young parents because of birthday of their baby. 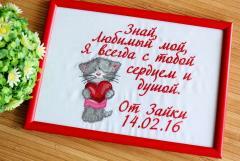 Baby cupid machine embroidery design is universal sample for such goal. Just change original color scheme of this picture as author did for this work piece. You also may use this picture for any other goals you need. This is nice little handbag from beautiful leather with delicate shade. 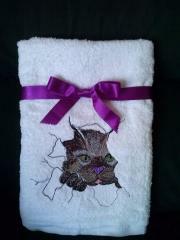 It can be good hand made gift for Christmas and New year holidays. 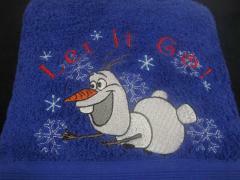 It is because of Gingerbread symbol free embroidery design used for decoration of its front side. Author executed this embroidery sample twice with different colors of thread. But both of them look like mouth-watering gingerbread with great taste. 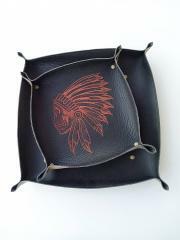 This is cool set of three leather plates and one box of same material made by Odinė idėja. Each of these plates are decorated with metal buttons on corners and Indian skull machine embroidery design 2 in central part. Due to different sizes they can be used for keeping little and big accessories which you may want to place in it. Durable leather is nice material which will serve you for many years. 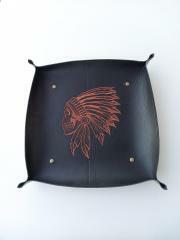 This is cool hand made souvenir executed by Odinė idėja from durable dark leather. It is very practical material: if it is dirty you just need to clean it with wet fabric. Please pay your attention on metal buttons on this work piece’s corners. When you fasten it you have plate; when you open it you have leather mat. Anyway its central part is decorated by Indian skull machine embroidery design 2. These two leather plates made by Odinė idėja. They are part of cool set including some more items. All of them are made from durable dark leather so it is not problem at all to clean it. Furthermore each work piece is added by metal buttons on corners: when they’re fastened it is plate, when they’re open it is mat. Plates are decorated with Indian skull machine embroidery design 2. There is the gift set for the first birthday of little girl which is decorated with many memorable inscriptions on the plush bunny’s t-shirt and yellow towel. 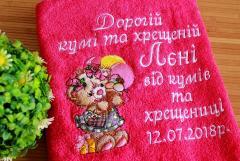 But its true highlight is the embroidered picture of little bunny with huge bouquet and long ears. 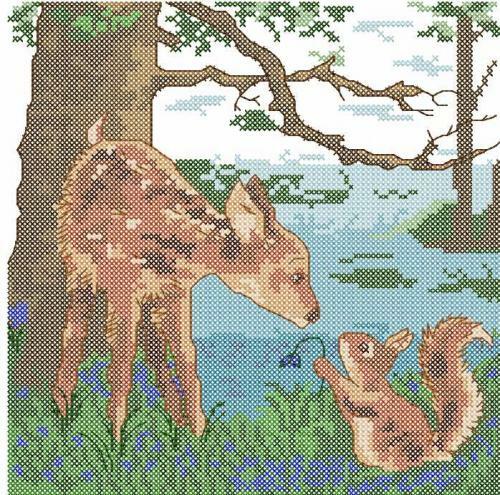 It is made with the scheme of Sad bunny Mi machine embroidery design. The image is executed with the predominance of pink color which is usually considering as traditional for girls. 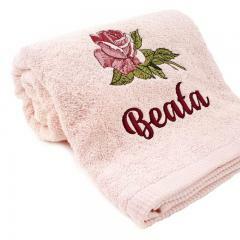 This is pretty terry towel prepared by Bubu craft as gift for lady with beautiful name. It is executed in gentle color scheme which is so suitable for this tender bath accessory. It is decorated with Mega Rose embroidery design. It is amazing picture of splendid rose in realistic manner. If you lie this embroidery sample you also may use it for your own work piece. This is original cover for school copybook which is able to make your child center of classmates’ attention. It is really not only practical thing but also interesting accessory. 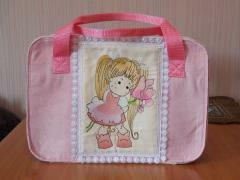 Its surface is made from different kinds of fabrics and decorated by Beautiful pony free machine embroidery design. 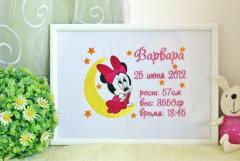 It is also added by thematic inscription and its owner’s name made with all colors of rainbow. 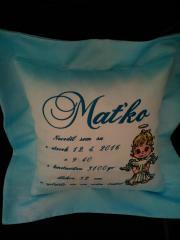 This picture shows pretty interior cushion prepared by loving mother for her dear son. It is nice and convenient gift and furthermore it contains subtle joke right on its front side. Here you may see little fluffy bear which also… hold small soft pillow in its paws. 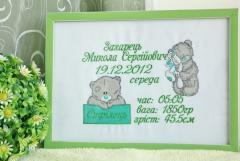 Her son will definitely be happy to get such original present decorated by Sad teddy applique embroidery design from beloved mom! 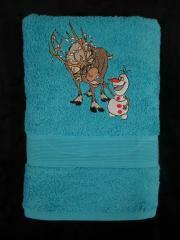 This is nice terry towel which is always good gift. 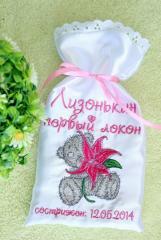 But it becomes even more pleasant if this gift is decorated with original and cute embroidery sample. 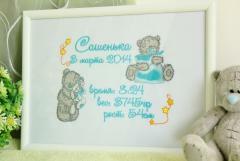 On this example you may see Ice cream for teddy bear embroidery design. This funny picture executed in cartoon style reminds everyone about his or childhood when ice cream was one of most favorite things!